“Fluorescent” means emitting light that comes from a reaction within the emitter. “In situ” refers to the fact that this techniques is done with the chromosomes, cells or tissue in place (in situ) on a microscope slide. 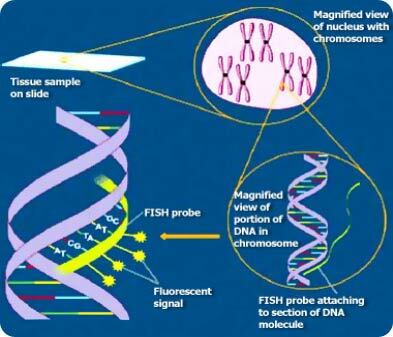 Multicolor fluorescence in situ hybridization (FISH), in its simplest form, can be used to identify as many labeled features as there are different fluorophores used in the hybridization. By using not only single colors, but also combinations of colors, many more labeled features can be simultaneously detected in individual cells using digital imaging microscopy. DNA is a double stranded molecule, and when it is chemically denatured and separated into two strands, it quickly reanneals into a double stranded conformation. Thus, when a single stranded probe is incubated with a single-stranded (denatured) metaphase chromosome (or interphase), the probe will bind to complementary DNA sequences to reform the double stranded molecule. Overall, the most critical step when using FISH is the choice of adequate probes. A DNA probe is defined according to its target or complementary DNA in metaphase and interphase cells: (1) repetitive sequence probe, (2) whole chromosome (painting), (3) locus-specific probes. Repetitive sequence probe are generated from repetitive sequences found in the middle of each chromosome. Researchers use these probes to determine whether an individual has the correct number of chromosomes. These probes can also be used in combination with “locus specific probes” to determine whether an individual is missing genetic material from a particular chromosome. Locus-specific probes are bind to a particular region of a chromosome. This type of probe is useful when scientists have isolated a small portion of a gene and want to determine on which chromosome the gene is located.